We’ve got a hot comet on our hands. Comet Jacques barely cracked magnitude +11 at the time of its March 13 discovery, but just three weeks later, amateur astronomers have already spotted it in large binoculars at magnitude +9.5. Expert comet observer Michael Mattiazzo, who maintains the Southern Comets Homepage, predicts that if Comet Jacques continues its rapid rise in brightness, it might become faintly visible with the naked eye by July. The comet’s currently inching across the southern constellation Antlia headed toward Puppis and Monoceros later this month. Observers describe it as “very diffuse” with a large, dim coma and moderately compact core. Photos show a short tail pointing east-northeast. This past weekend C/2014 E2 passed closest to the Earth at 89.3 million miles (144 million km) on its way to perihelion on July 2. Right now, observers in southern latitudes have the viewing advantage. 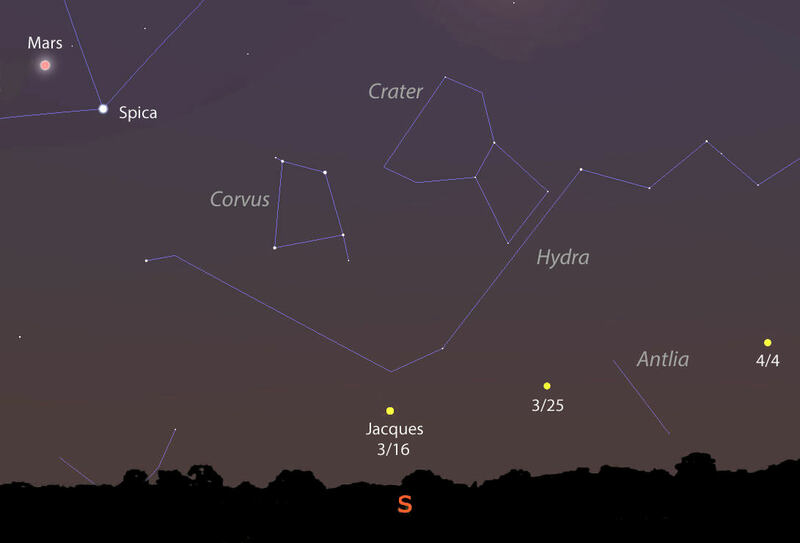 As seen from South America and Australia, Comet Jacques floats high in the southwestern sky at nightfall. Observers in mid-northern latitudes can see it too, but have to set their sights lower. A week ago I tried tracking down this newcomer with a 37-cm (15-inch) Dobsonian reflector around 9 o’clock. With Jacques only 14 degrees high at the time I had to kneel beside the telescope to see into the eyepiece. Try as I might, I suspected only a fuzzy patch at best. Light pollution and low altitude were partly to blame, but Jacques’ diffuse appearance may have contributed to the uncertain observation. Other mid-northern latitude observers may have shared my sore kneecap experience in similar attempts. But that will soon change. C/2014 E2 continues to increase in altitude throughout the month, offering easier viewing as soon as mid-month. April 16 through early May the moon will be gone from the sky and provide a needed dark time slot for viewing the comet before it’s lost in evening twilight. 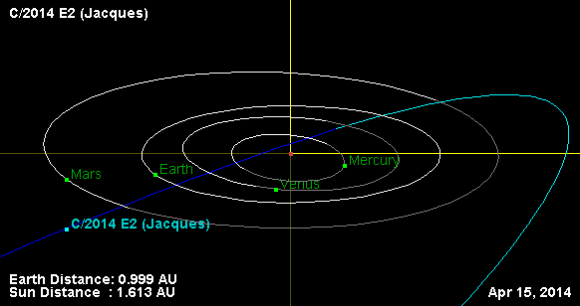 Comet Jacques will likely be brighter than magnitude 9 as it slides from Puppis into Monoceros. Find a place with a dark sky to the southwest and start looking at the end of evening twilight when the comet is highest. The map shows stars in reverse making it easier to use in crowded star fields. By mid-July, Comet Jacques will have passed perihelion 61 million miles (98 million km) from the sun and transition into the morning sky as it rapidly swings northward across Taurus, Auriga and Perseus. Though the comet will be half again as far from Earth as it is today, it’s expected to become considerably brighter and more condensed after a good “roasting” by the sun. C/2012 E2 will join a veritable team of comets expected to reach or approach naked eye brightness in late summer and fall: C/2012 K1 PANSTARRS, C/2013 A1 Siding Spring and C/2013 V5 Oukaimeden. Much to look forward to! Congratulations to Cristovao Jacques and the SONEAR team! 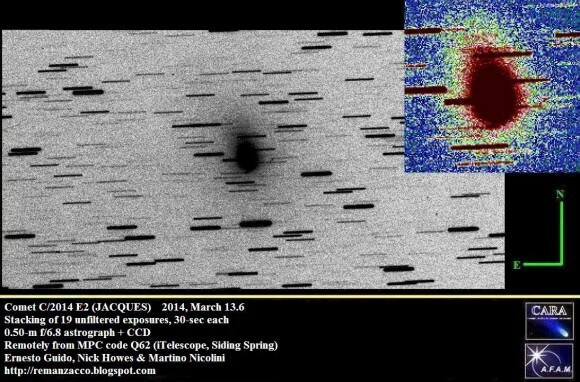 On March 13 they snared C/2014 E2 (Jacques) in CCD images taken with a 0.45-meter (17.7-inch) wide-field reflector at the SONEAR (Southern Observatory for Near Earth Asteroids Research) observatory near Oliveira, Brazil. A very preliminary orbit indicates its closest approach to the sun will occur on June 29 at a distance of 56 million miles followed two weeks later by a relatively close flyby of Venus of 0.09 a.u. or 8.4 million miles (13.5 million km). If a comet approached Earth this closely so soon after perihelion, it would be a magnificent sight. Of course, watching from Venus isn’t recommended. Even if we could withstand its extreme heat and pressure cooker atmosphere, the planet’s perpetual cloud cover guarantees overcast skies 24/7. It’s the team’s second comet discovery this year after turning up C/2014 A4 (SONEAR) in January. Comet Jacques has been tracking across northern Centaurus since discovery. Over the next few nights, it straddles the border with Hydra where it will be visible low in the southern sky around for northern hemisphere observers from about midnight to 2 a.m. If you live on a Caribbean island and points south your view will be even better. Comet Jacques exhibits a dense, fairly bright 2-arc-minute coma or cometary atmosphere with a short northward-pointing tail. Brightness estimates have been hard to come by, but it appears the comet may be around magnitude +11.5 – 12 or within range of an 8-inch (20-cm) or larger telescope. One thing’s for certain. In the coming weeks, E2 will be approaching both the Earth and the sun and brightening as it slowly gains altitude in the evening sky. Shortly after perihelion, Comet Jacques will shine brightest at around magnitude +10-10.5 (though it could be brighter) and remain nearly this bright as it swings north from Orion into Perseus from mid-July to mid- August. Closest approach to Earth occurs on Aug. 29-30 at 54 million miles (87 million km). It will join Comet Oukameiden – predicted to reach binocular visibility in late August – to offer comet lovers much to look forward to as the summer wanes.